Jesus' first order of business after entering Jerusalem was to head to the Temple. The way Mark tells the story, it seems that Jesus would have gotten started earlier if he hadn't arrived so late on Palm Sunday. But day 2 of Holy Week brings us straight to the Temple on Mount Zion in Jerusalem. The Temple was the central place in Jewish society, it was a symbol of their hope but it was also sort of an economic hub for them. It was meant to be a location where the true presence of God was displayed. That's what all the weird laws in the Old Testament regarding who could and couldn't enter the temple and how they could and couldn't enter it were all about. It was meant to be a foretaste of the Olam Habbah, the coming world, the reign of God. But It had become a place, at least in its outer courts, not just for spirituality but for buying and selling and even donating funds for the Temple treasury. 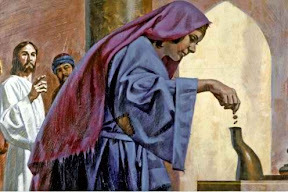 We see evidence in Luke's gospel that the Temple treasury had become a means for taking advantage of the poor (see Luke 20:45-21:4). In fact, I think that the heart behind Jesus' shocking prophetic display in the Temple is revealed most clearly in Luke's gospel. Now, for some reason, churches have used this passage to support tithing campaigns and generosity seminars. But in its context, the message is strikingly different. Jesus is exposing injustice, not encouraging people to be more like the widow. He's saying, "look how tragic this is!... the poor are struggling and scraping to pay, only to line the pockets of the rich while the comfortable are paying out of their abundance and comfort. This isn't fair! And this is not how it's supposed to be!" The temple has become a location for oppression rather than a location for the coming reign of God--the God of love and justice. for all nations? But you’ve turned it into a hideout for crooks'" (Mark 11:17 CEB). Jesus approach to justice is not merely based on what's fair and unfair (although that's certainly part of it). Jesus' approach is, perhaps ironically, much within the tradition of the Temple itself. Jesus' approach flows from eschatological vision, a view of what the world, under the reign of God, will be like. He doesn't just point out the immediate injustice, turning the tables, etc. He points to a future beyond the immediate scope of the average do-gooder, "the Temple of God is supposed to be a place for all the world, all nations, to get in tune with the heart of God!" Jesus came not just to patch things us. He came to set things on the right track again to become what they were created to become. The Temple was meant to foreshadow something bigger than itself. Indeed, the Temple was meant to be the foretaste that Jesus himself came to embody. Jesus' prophetic action on the second day of Holy Week is a convicting reminder that people are the purpose of systems and traditions, not the other way around. And it's an invitation to search ourselves to see what tables need to be turned over in us. Where have we placed ourselves over others? Where have our lives become a display of something other than the true reign of God? Where are we hiding our crooks? And it is an invitation to stand against injustice with prophetic imagination and eschatological vision, to be the change that God wants to see in the world... knowing full well that it will lead us to the cross but also to resurrection. God of justice, let our hearts be your dwelling place. But do not let us take this lightly. We know that there are tables that need to overturned. We know that we have thieves hiding in us and we know that we have already solidified some habits that are quite contrary to the desires of your heart. But we invite you anyway. Come and dwell in us and make us your reflection. Help us to be the harbingers of your new creation, not just for those who are like us, not just from our positions of comfort, but from solidarity with those who are in the most need. Let your house be bigger than us... a house of prayer for all nations. Amen.